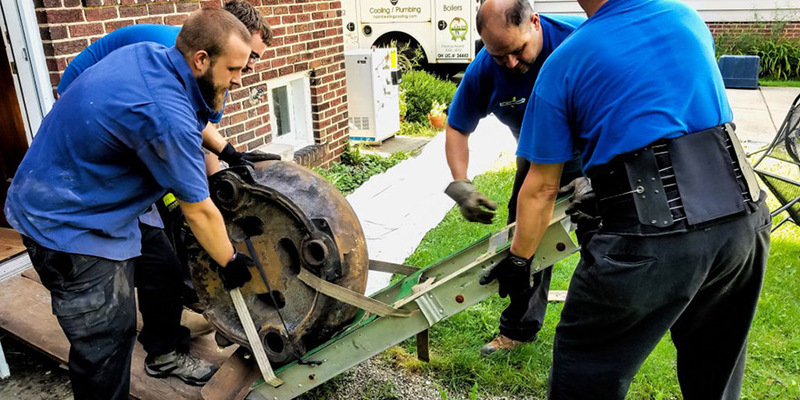 Not exactly like a movie with four men and a baby, but we do have to baby this old boiler when taking it out of a basement. This is just one section of the old boiler, but baby it we still must, least it gouges a wall or tear into a piece of wood molding. Care is taken in not only easing it in an out of that first step into the house, but additional care is preemptively taken to insure the customers’ back walkway is protected. How many contractors do you know that protect the rear walkway of a house? Not many we guess. And we just don’t pull the drop cloths and floor protection out for “special clients”. We do it on every job. This attention to detail and respect for our customers’ property both inside and out, applies to all of Verne & Ellsworth Hann’s jobs regardless of where we are working. The same approach applies to Pepper Pike or South Euclid, to Cleveland Heights, Shaker Heights, University Heights and the rest of the Greater Cleveland Area. This is just one more reason why, when it comes time to replace a major piece of heating or cooling equipment in your home, there is added value in selecting Verne & Ellsworth Hann. People believe they are comparing apples-to-apples by looking at the bottom line of a proposal. But, in fact, there is more than meets the eye when choosing a quality contractor that not only complies with State and National building codes, but exceeds them. This is called Code Plus work. Code Plus work should be the standard by which you hold all of your contractors accountable. But is there a quality above and beyond that standard? Yes. It’s the Verne & Ellsworth Hann work ethic. It’s a tangible aspect to every job we undertake. While seemingly intangible while comparing contract numbers, it’s acutely tangible when you get a word-of-mouth referral about our company. That’s because someone you know has witnessed firsthand the level of excellence we provide and has made a recommendation to you. Read all of the reviews. Look at all the pictures. Compare all of the numbers. Most importantly of all, listen to what your friends and neighbors have to say. Then, call the best in the business; Verne & Ellsworth Hann. 216-932-9755.